Survey Results: How do you upgrade software? If you’ve purchased hospitality software in the past, you know that upgrading the technology your team uses day in and day out can have a significant impact on overall performance. You also know that wanting to upgrade doesn’t necessarily translate into the ability to do so. There are a lot of factors involved in hospitality software upgrades from ROI to budget to data migration and training time, not to mention prioritizing among other business needs. Amadeus recently conducted a survey about the process of upgrading software in the hospitality industry. We asked you to share your main challenges behind the purchasing process, and how you make upgrading a reality. Here are the results. 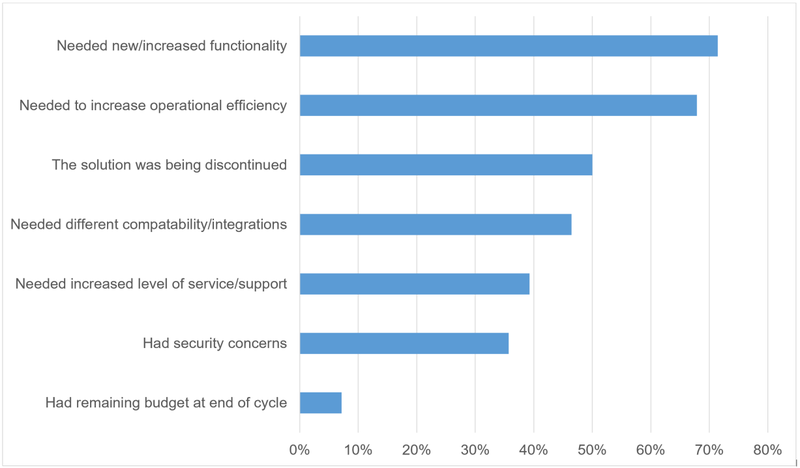 Respondents selected all reasons they have upgraded software throughout their careers. While many options were selected and elevated as reasons to upgrade, a few bubbled to the top. The #1 reason people have upgraded software is because they needed new functionality or increased functionality followed closely by the need for increased operational efficiency. While there are a number of factors that may drive the consideration of a software upgrade, those factors don’t necessarily align with the primary outcome expected once the implementation is complete. It’s also important to note that the main reason for considering a software upgrade could change over time and new functionality or capabilities may become even more important to a larger audience. For more about how centralizing data can help you achieve “big data” insights at the portfolio level, check out our blog post. With more stakeholders than ever before, budgets disseminated across teams, and budgets altogether tighter, purchasing software is no small task. The 2018 Hotel Lodging Technology Study reveals IT budgets continue to be down at about 4% of total budget in 2017, compared to their peak in 2015 at 6% of total budget. That being said, the study also shared that 61% of hotels believe they will increase their IT budgets in 2018 and 1 out of 6 hotels made hefty investments in IT in 2017, so there is hope. Respondents of the Amadeus survey cited making a compelling ROI case as their second greatest challenge, which would, of course, help to find the budget dollars that continue to allude software purchasers. If you’re thinking about upgrading your software, Amadeus can help. We understand the challenges of implementing a new or upgraded solution and we’ll partner with you to provide a personalized ROI analysis for your property.